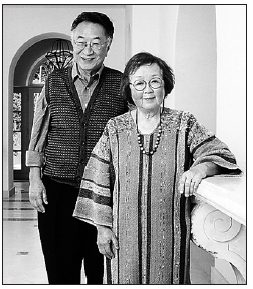 The Paul I. and Hisako Terasaki Center for Japanese Studies is celebrating its 25th anniversary with a tribute dinner beginning at 5 p.m. on Saturday, May 20, at the UCLA Luskin Conference Center. “The tribute dinner honors the center’s accomplishments and Dr. Paul I. Terasaki’s visionary leadership,” said Hitoshi Abe, director of the Terasaki Center. “Dr. Terasaki was committed to deepening the understanding of the history and global context of the U.S.-Japan relationship and to preparing the next generation of leaders in Japanese studies,” said Irene Hirano Inouye, dinner co-chair and president of the U.S.-Japan Council. Other dinner co-chairs include Ralph Shapiro, Dr. Keith Terasaki, Bob Kopple and Tetsuo Tanimoto. Terasaki, who died on Jan. 25, 2016, developed the methodology for tissue typing, a necessary procedure for successful organ transplants that is still used today. During his lifetime, Terasaki donated more than $6 million to the center, including a gift of $1 million in 2015. “Through the generosity of Dr. Paul and Hisako Terasaki, we’ve expanded our focus on contemporary Japan and broadened the reach of programs throughout the community,” Abe added. In 2010, UCLA dedicated its Terasaki Life Sciences Building in recognition of the $50 million donation Terasaki made to the Division of Life Sciences in the UCLA College of Letters and Science. In 2012, he was awarded the UCLA Medal, the university’s highest honor. Born in the Boyle Heights area of Los Angeles, Terasaki and his family were incarcerated during World War II at the War Relocation Authority’s Gila River camp in Arizona. He and his wife, Hisako, were married in 1954. He earned his bachelor’s and master’s degrees and doctorate from UCLA, where he became a professor of surgery. In 1984, Terasaki founded One Lambda Inc., which furthered tissue-typing research. The company was sold in 2012 to Thermo Fisher Scientific Inc. for about $925 million. The 25th anniversary honorary committee includes: Gene Block, UCLA chancellor; Akira Chiba, consul general of Japan in Los Angeles; Norman Mineta, former U.S. Transportation Department secretary; Fred Notehelfer, former Terasaki Center director; and Hisako Terasaki. The Terasaki Center for Japanese Studies was founded in 1991 as the UCLA Center for Japanese Studies and renamed in 2005. The UCLA Luskin Conference Center is located at 425 Westwood Plaza on the UCLA campus. The Terasaki Research Institute is located at 1018-1024 Westwood Blvd. Proceeds from the UCLA Terasaki Center for Japanese Studies 25th Anniversary Tribute Dinner will benefit the Terasaki Graduate Fellowship fund, which supports UCLA Japanese Studies graduate students. For ticket information, sponsorship opportunities and event details, contact Marti McElreath at (310) 825-4500 or [email protected] or visit http://giving.ucla.edu/tcjs25.